Naomi: Chicken soup has always been a winter comfort food in our house. I only make chicken soup from Rosh Hashanah until Pesach — and only use this recipe on Pesach. During the winter, I make a hearty broth with lots of vegetables. When I found this recipe some years ago in an issue of Bon Appetit, it caught my eye. Its flavor is light and delicate, but extremely satisfying. I serve it with herbed matzo balls. 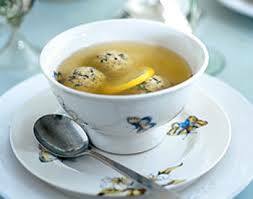 Add any herbs and seasonings that appeal to you to your favorite matzo ball recipe. I usually throw in chopped fresh parsley, thyme, sage and/or dill and some cumin or ginger. It’s a perfect, refreshing start to a Seder meal and harkens the coming of spring. 1 4 1/2- to 5-pound or 2-2.5kilo chicken, cut into 8 pieces, rinsed well, excess skin and fat cut away and discarded. Place chicken in large bowl. Add boiling water to cover. Let stand 2 minutes; drain well. Using small knife, scrape skin to remove any surface fat. Rinse with cold water; drain again. Bring 5 quarts water to boil in heavy large pot. Add chicken. Return to boil, skimming impurities. Cook until broth is clear, skimming as needed and stirring occasionally, about 15 minutes. Add onions, yam, carrots, parsnips, and celery. Partially cover and reduce heat to medium-low; simmer until chicken and vegetables are tender, about 1 1/2 hours. Add dill and parsley to soup; simmer 3 minutes. Remove from heat and let stand 1 hour. Season to taste with lemon juice, salt, and pepper. Ladle into bowls. Add 1 lemon slice and matzo balls to each.